Jacob Green of Norton pictured after winning 3-2-1A state wrestling title. The Nex-Tech Wireless Western Kansas Athlete of the Month from Sports in Kansas is Norton Community High School senior athlete, Jacob Green. 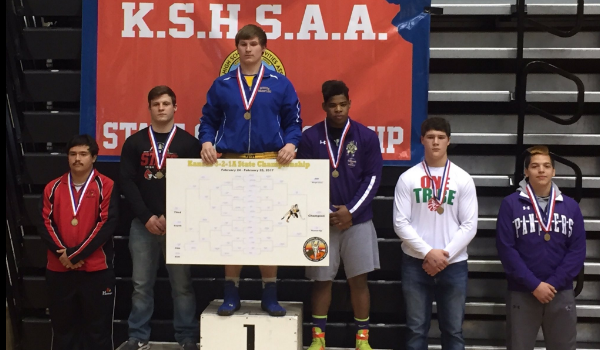 Green, a 220-lb senior wrestler, won the 3-2-1A state wrestling title in his weight class in Hays on Saturday. Green, also a three-time all-state selection in football, won over Chris Cox of Hoisington (Fall 0:39) to capture his first state wrestling title. Green finished the season with an impressive 30-1 record. Green took third as a freshman in the 220lb class as a freshman in 2014. Norton also won the team title, giving them their fifth consecutive state title in 3-2-1A. Collyn Auker (285 lbs) and Ryan Johnson (120 lbs) also had individual titles for Norton. Sports in Kansas and Nex-Tech Wireless are in partnership over the 2016-2017 school year to release a Central Kansas and Western Kansas Athlete of the Month, two separate monthly honors. Schools west of Russell, Kansas (including Russell) in the Nex-Tech Wireless footprint (click to see) qualify to be nominated for the Western Kansas Athlete of the Month and schools East of Great Bend (including Great Bend) qualify to be the Central Kansas Athlete of the Month (click to see). You can nominate an athlete over the last seven days of the month by emailing chetkuplen@kansas-sports.com, please provide stats.